Kilo has a home! 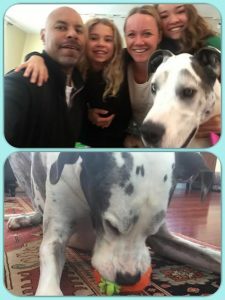 - Rocky Mountain Great Dane Rescue, Inc.
Kilo has a home with his new forever family Allison, Seth and their 2 daughters. The family were fortunate enough to spend time with Kilo as they lived down the road from his foster family! They fell head over heels for the big fella, so, they filled out their application straight away. Just in time for the holiday, Kilo will get plenty of undivided attention as he will be the families only pet. We couldn’t be happier for Kilo and his new family. Way to go sweet boy.